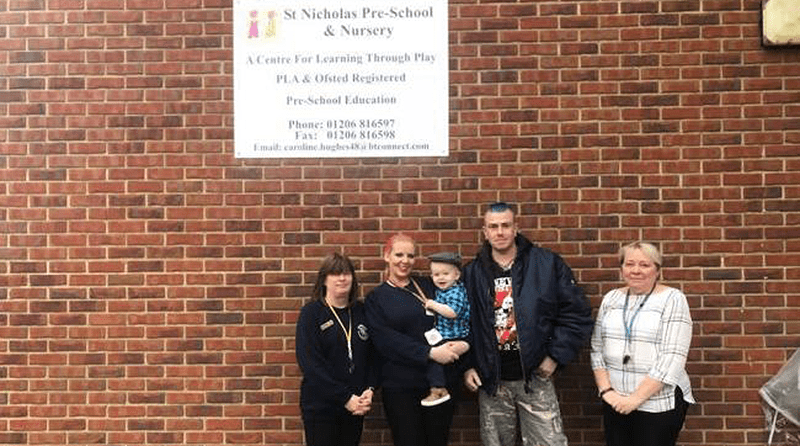 Kingsley-Phoenix Kiely-Lloyd, who is 16 months old, was rushed to St Nicholas Pre-school, Colchester, by his frightened father when he started having a seizure. Deputy Manager, Sue Mullan, and a senior practitioner, Debbie Treacy, were the first to attend to the child. “It was the end of the day and there was an almighty bang on the door,” said Ms Mullan to the Daily Gazette. “We opened the door and he had the baby in his arms and the baby was blue. “We kept reassuring each other. In the meantime, Debbie took his coat off because he was hot and got him in the recovery position, keeping his airways clear. “We kept going and his breathing started to settle. “We had to blow into his mouth and kept talking to each other and to him until the ambulance arrived. “I realised the gravity of the situation from the word go,” said Kingsley-Phoenix’s dad, Kevin Lloyd. “Luckily we were parked outside. “I rushed across the car park and banged on the door; I’m amazed I didn’t break it. “There are not enough words to thank them,” said Kingsley-Phoenix’s mum, May Kiely, who also works at St Nicholas Pre-school. While she stayed with her son, her two colleagues, Michaela Clarke and Claire Middleton, attended to her class. It is believed that the seizure was caused by a virus or infection. Doctors mentioned to the parents that this specific virus/infection presents itself in the form of seizures as opposed to a fever. Mr Lloyd now wants to raise awareness about their experience to warn other parents, should they be faced with a similar incident, and will be hosting child benefit gigs with his punk band.